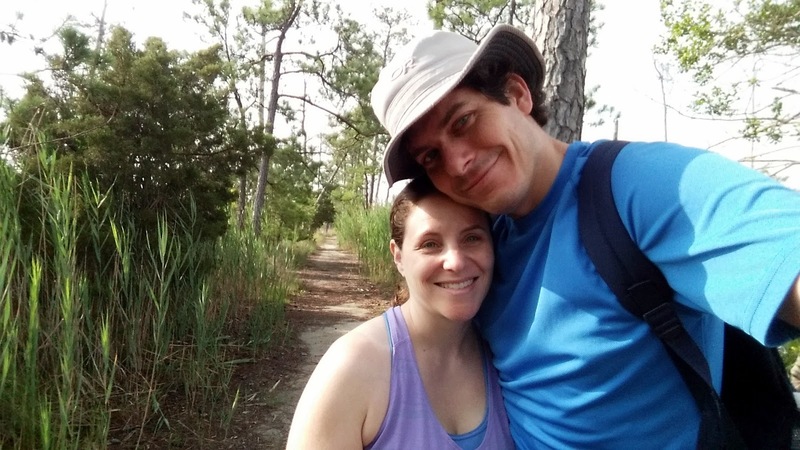 After a few days in a plush hotel I dragged Shira and J to Point Lookout Maryland State Park for some camping. The park promised a beach, birding and history and delivered on all fronts. Our original plan was to stay at the park from from Thursday to Sunday. However, the full day of rain forecast for Saturday, caused us to trim the trip down to just Thursday night and Friday. Still, we packed a lot of adventure in this one overnight. The first order of business was to setup camp. Our campsite (#144 in the Hoffman Loop) was perfect: a bit secluded, but an easy walk to the (very clean!) bathrooms. After that was taken care of, it was off to the beach. The beach, while not as flawless as Cumberland Island, was still quite nice. After the beach, it was back to the campsite for dinner. We supplemented our usual hot-dogs and baked beans cooked over the fire with corn on the cob. Turns out, it's easy to make: just wrap the corn and a couple of tablespoons of water in a aluminum foil and toss in the fire for 20+ minutes. The results were quite tasty! Thursday night, we had our traditional camping trip thunderstorm (a tradition I'd very much like to discard). The lighting was blinding, the thunder was booming, but no strike ever got within a mile of us, so there wasn't really anything to worry about. Friday morning the storm had cleared up and we a day of sun to explore the park. Friday morning, after breakfast and the campsite had been cleaned up, we took a short hike through the marsh. The ospreys and herons active, giving me plenty of interesting photo ops. From there we made our way to the point itself and tried to explore the lighthouse. To Shira's relief, it was closed. I dragged J over to look at the pelicans and asked him what he saw. His reply: a shark. As I tried to explain to him how wrong he was, I saw the same fin he saw in the water. He wasn't crazy at all -- though it wasn't a shark was seeing, it was a stingray. It was an excellent find! Next it was off to rent a canoe. Unfortunately, because of the impending storm they weren't renting. Oh well, we'll have to try again next time. We then hit the beach for more fun in the sun. I busted out our $20 Amazon raft and J and I had a heck of time playing with it. As beach time turned into lunch time, I had one last request: could we go explore Fort Lincoln? The sign on the beach said it was a 1/4 of a mile away. Shira and J were up for it, so off we trudged. I was expecting to find a simple sign detailing the fort, but was instead greeted with the fort itself! (though the buildings are reconstructions). We were able to get into a number of the buildings, which was a nice bonus. From there, we followed signs to the Prison Pen and arrived at at the infamous Point Lookout Civil War Prison Of War Camp. There's not a whole to see in the prison section, but what is there made quite an impact on me. They've got a section of wall reconstructed, and markers showing where the deadline was. Apparently, the origin of the word deadline goes back to the Civil War POW camps, and means what you think it means: prisoners who crossed this line could (or would?) be shot. Life was horrific in the camp and over 3000 inmates died there. There's an impressive monument to those lost that's visible as you enter Point Lookout State Park. History, hiking, swimming and roasting marshmallows over the fire. What more could one possible ask for in a camping trip? Looks Great and I Can Eat It? What's Not To Love?